Joining Bart this month are Nick Riley, and Guy & Gaz from the My Mac Podcast. The show starts with some not-so-quick followups to stories from previous months, before moving on to look at just one notable number – iPhones appear to have been gifted twice as often as Samsung Galaxies this holiday season. Next, the panel discuss some of the Apple-related legal stories that broke in December – including the never-ending Apple -v- Samsung saga. The four main stories are the decline of the rest of the smart watch market while the Apple Watch continues to prosper, Apple’s move to start publishing academic papers in the AI field, the release of the Air Pods, and battery controversy for the new MacBook Pros. 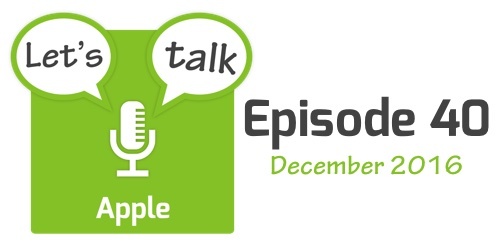 The show finishes with a quick rundown of some other shorter Apple-related stories that made the news in December.